With Visual Basic.NET, Microsoft transforms Visual Basic into a supercharged tool for developing next-generation Web services and Windows applications. 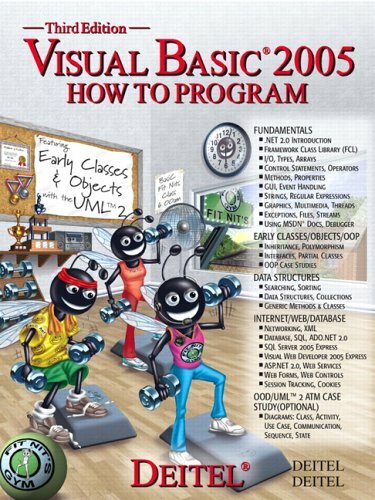 Now, learn Visual Basic.NET hands-on, through thousands of lines of live code in hundreds of complete working programs -- explained with exceptional clarity by the renowned programming trainers of Deitel & Associates! Visual Basic.NET How to Program starts by introducing the Visual Studio.NET development environment; then covers all key VB.NET programming fundamentals, from control structures to methods, arrays, and object-oriented programming. It delivers in-depth coverage of VB.NET GUI development; multithreading; graphics and multimedia; XML programming; database development with SQL and ADO.NET; building Web Forms and Web Services with ASP.NET; network programming; data structures; accessibility; and more. The book contains hundreds of real-world tips and techniques for writing high-quality code, improving performance and reliability, and efficient debugging. For all beginning programmers -- and developers experienced with traditional languages -- who want to master Visual Basic.NET quickly. Dr. Harvey Deitel is one of the world's leading computer science instructors and seminar presenters, and author of more than a dozen books. He worked on the pioneering operating system teams in industry and academia that developed many of the techniques at the heart of operating systems like UNIX®, Windows NT™ and OS/2™. Paul Deitel has taught Visual Basic, Java, C and C++ at numerous hardware and software companies, including Sun Microsystems, Digital Equipment Corporation, IBM, Open Environment Corporation, Adra Systems, and Cambridge Technology Partners, and is himself an expert developer. The Deitels are principals of Deitel & Associates, Inc., an international training organization specializing in Visual Basic, Java, C and C++, and object technologies. Deitel, H. M. Deitel, P. J.